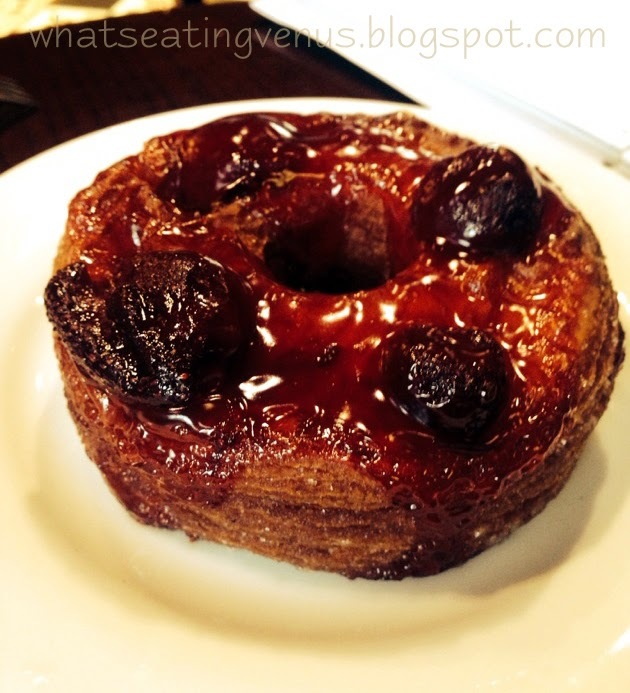 I can pretty much compare the cronut craze with that of J Co. I remember seeing insanely long queues in every J Co branch last year when the Singapore-original doughnut house was first launched in the Philippines. That alone made me grow an unfounded hate for the product. It's only early this year when I tasted my first J Co doughnut and I must say it's good -- though not good enough for me to wait for at least an hour to queue. Sorry, fans! Now now, going back to cronut -- or lemme use the spelling of those which I was able to sample already -- croughnuts. I know it's kinda late but I have only tasted my first croughnut last Friday at Highlands Coffee in Emerald Ortigas. Had the board chosen to hold the meeting somewhere else, I wouldn't be blogging this now because my curiosity for this dessert had long since died down. I'm easily bored and forgetful like that. The verdict? Can I just say that I can share more about their coffee than their croughnuts? Haha. Obviously I have nothing to compare these pastry hybrid with because I have not tried the other brands yet so you should make do with a brief description. Sorry, I'm such a bad reviewer. So the above-most photo is the Chrough-nut Apple. It looks super sweet but to my surprise, it's not. There's a hint of sourness in the apple that makes it very interesting. This is my favorite flavor among the three. The second photo is Chrough-nut Cinnamon Sugar. I love cinnamon in general and this one made me expect for a really cinnamon-y bite which to my disappointment, I didn't really get. Then I remembered I was not in Cinnabon and I was all good. Though it says sugar, it's not so sweet either -- a plus point for me. The last flavor is Crough-nut Strawberry. OK I'm not a big fan of anything berry so this is automatically not the best for me. Just like the others though, it's not so sweet. What's interesting is that I expected it to be more sour than the apple and turned out the otherwise. I don't know exactly what to look for when eating a croughnut. If I'll be honest, aside from the flavors, what I liked most about them is the texture of the dough. I loved that they're very crunchy and tasty without the kind of annoying sweetness most doughnuts offer. If not for the crazy price (though these are relatively cheap at only 99Php each), I sure would get this over doughnuts any day. 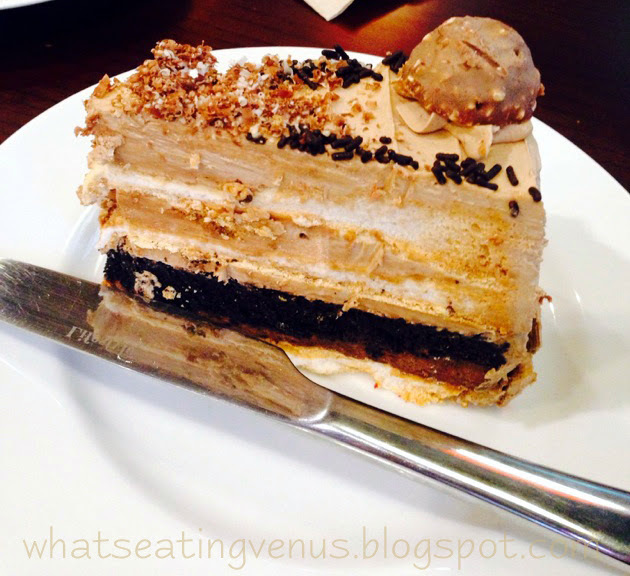 Below is a slice of Highland Coffee's Hazelnut Praline Cake. After finishing those croughnuts I believe I have a reason to say that just a mere look at another piece of dessert is already unappetizing. Good thing we were in a group and we practically shared almost everything we ordered. I grabbed a couple of bite from this slice and noooo. Not a fan of butter bar disguised as cake. Sorry again, fans! This made me literally cringe. Anyway, so like I mentioned above, I also have a lot of things to say about their coffee. You know my love and hate relationship with caffeine so I won't reiterate anymore but basically, I loved theirs! I sipped from a friend's Iced White Mocha and was amazed at how not sweet it was. Same goes with another officemate's Cookies and Cream Freeze. Cookies & Cream is one of my favorite flavors when it comes to food and drink and it's almost always sweet so this really was a very welcome disappointment for me. I'd like to make a hasty generalization that all their food and drinks are not as sweet compared to most coffee shops and because of that alone, they're now one of my favorites. 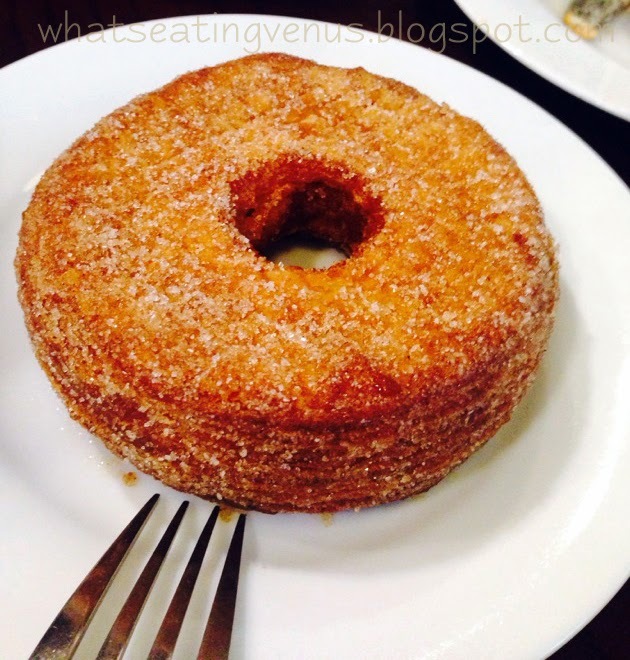 How was your first croughnut experience? Where do you suggest I try one next? 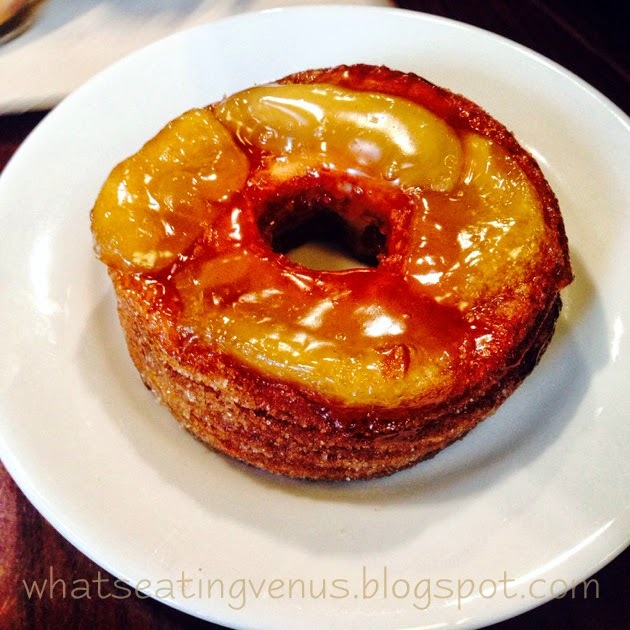 Haven't tried a cronut/croughnut before but I hear raves from people who've tried the ones from Wildflour! Ohhh so that's what croughnuts mean. Lol. I love croissant! I don't know if I'll like croughnuts too.